Bad Reputation have always been known for their Limerick shows, but the show they put together for their 10th birthday has to be one of the finest I’ve attended. Six bands were on offer… two from Limerick, two from the capital, one from Galway, and one from the UK, demonstrating a wide variety of genres. Located in Dolans’ Warehouse, rather than Bad Rep’s usual home in the Kasbah, it had a natural bigger feel, and a fine crowd to boot. I’m to give a quick take on all the lovely things that were on offer. I’d recommend dashing out to catch any of these bands if they’re in your town. The Limerick-based trio of beardy baldies started off the night with a set of largely new tracks. Their post-rock/stoner doom sound is on the minimalistic side. A lot of shoegazing and long, slow riffs broken by the occasional roaring chorus. I’ve seen them live on a good number of occasions now. They have a curious ability to lull the listener into a trance with the slow, heavy pulse of what they do. Because it’s so predictable (I heard it described as ‘very repetitive, but not in a boring sense’), you start to listen naturally rather than actively, making the pounding surprisingly ambient. It’s probably good that they were on early in the evening, though. As they might have looked a little anaemic next to the theatrics of the later acts. As it stood, they were a solid appetiser. I’m getting increasingly excited about their releases, but it’s their live performances that really shine. This act need no introduction at this point; especially in this city. Featuring Ciaran Culhane, who’s instrumental in Bad Rep himself (no pun intended), SHARDBORNE are a regular feature at Sieges and other Limerick events. They got some new tracks in alongside choices from 2015’s “Living Bridges”, all delivering the unpredictable, awe-inspiring prog they’ve become known for. Despite falling under the post-rock umbrella, they seemed the polar opposite of THIRD ISLAND. Fast, effect-laden, intense and unpredictable. One really is in awe of the kind of tricks they can pull with pedals and tempos. They had a little more showmanship than the stoic THIRD ISLAND, but nothing you could call theatrical, letting the music speak for itself. Again, they’re a band I’ve seen live a number of times, and they remain tight, loud and captivating. Many points on the scoreboard. I don’t think I was alone in considering MOURNING BELOVETH the biggest draw of the night, and I have to say they didn’t disappoint. They seemed to fill the stage to the brim after the relative minimalism of the previous acts, helped along by plenty of smoke and red lights, and with a four-song set that filled most of the hour, they made excellent use of twin-vocalist stylings and heavy melodic doom. Uncompromising, dramatic, heavy and elegant, it was the kind of performance that gets me going to live shows in the first place. Darren provided the doomy screaming and some haunting spoken-word stylings, while Frank supplemented him with brash, epic choruses. As a fan of more contemporary Irish doom, it was like having THE CRAWLING and DEATH THE LEVELLER/MAEL MÓRDHA on the same stage. They just had an astonishing grasp of what they do, and how best to present it. I think they’ve said this will be the only Irish MOURNING BELOVETH show in Ireland this year, which is a shame, because I’d easily travel around the island to catch repeat performances of this calibre. ‘What were they thinking?’ I said, when I saw that a relatively upbeat classic-style act were up at the end of the night after the tragic opera of MOURNING BELOVETH. A friend even remarked that he ‘didn’t like the cut of their jib’ when he saw a pink guitar on stage. But in practice, it kind of worked. SEVEN SISTERS are from ‘London Town’, as Kyle reminded us a few time. Putting both the ‘B’ and ‘HM’ in NWOBHM, they were fast, energetic and fun, with solos to die for. The contrast with the prog and doom of the preceding acts was more intriguing than jarring, and at the end of the day, we came out to be entertained. 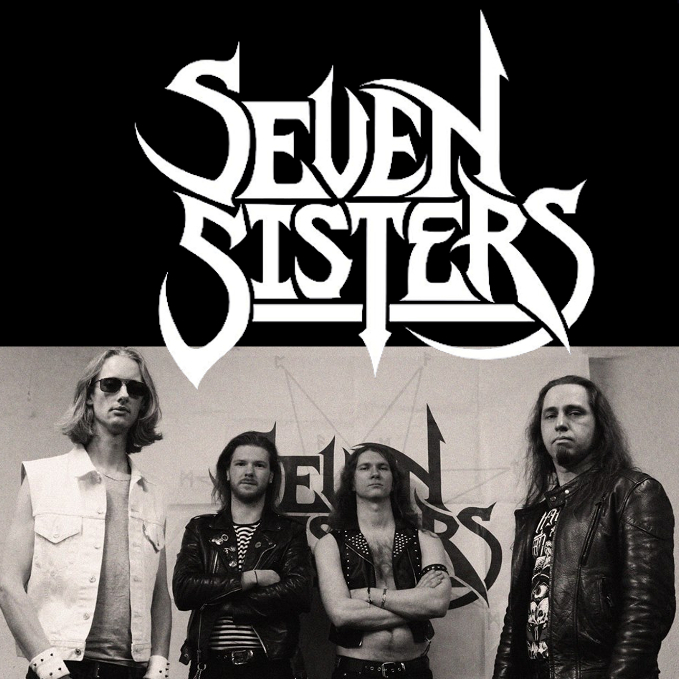 There are a lot of definitions for pure, no-nonsense metal, and SEVEN SISTERS have a wonderful one. Old-school metal by young, fun, confident lads who know their stuff. Most certainly worth your attention. Well here was a surprise. In my experience, folk metal acts struggle to sound distinctive in small venues, with the ‘metal’ overpowering the ‘folk’ almost completely, so while I went in with a fondness for the band, I didn’t expect much. I was utterly wrong. With showmanship, a diverse set of performers all getting their day, and sheer musical talent, they brought it around. NA CRUITHNE handled heavy and light numbers with aplomb, made it clear they were having incredible fun, and sent us home very happy. Of particular note was Ana Carolina dancing around with a fiddle and a giant smile, and Ciaran de Búrca folking up the main riffs on the bouzouki (look it up!). It was only a shame that the feadóg whistle couldn’t be heard through the mic. I’ve seen CRUACHAN and MAEL MÓRDHA live, and I’m happy to report that NA CRUITHNE are certainly a welcome addition to the Gaelic Metal canon. They have a real sense of identity to them as well, with a much jollier, more folky feel than most acts in their genre; outside Ireland, they’d be more comfortable alongside the likes of ELUVEITIE and ELVENKING than MANEGARM or EREB ALTOR. I’ve rambled enough, but they had an exceptional performance with a well-justified encore. It’s not a competition, so I won’t be so childish as to pick the best act of the night; everyone put in a strong performance, and the six-act format was great, allowing a wide spread of acts to do different things well. I had a friend with me who had never been to a metal gig in his life, and it was nice to be able to introduce him to the world of heavy stuff with a lineup that varied widely in style, and not in quality. The bi-annual Siege of Limerick is obviously Bad Reputation’s priority, but if they can get more of these larger shows together, it’ll be a fine thing for all concerned.